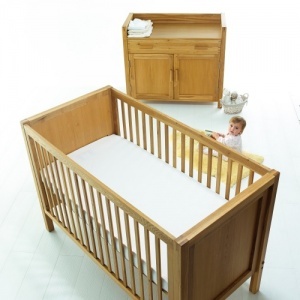 A beautifully hand crafted cot bed mattress from mattress experts The Little Green Sheep. Offering you and your baby the most luxurious of support, every mattress uses a clever combination of certified organic wool and cotton to create a pure and healthy sleeping environment away from chemicals. "Certified, anti-allergy mattress" - Soil Association certified and handmade in Wales, this chemical-free organic wool cot mattress 60x120cm or 70x140cm is extra breathable and perfect for babies that suffer from allergies or eczema. This Organic Wool cot mattress is handmade in the UK with a deep, firm support and is the only cot mattress to be certified by the Soil Association as organic; ensuring great quality whilst supporting local suppliers. With zero chemicals and using only the finest quality materials, each specifically chosen to help provide the safest and best cot mattress for your baby. What goes into an Organic Cot Mattress? * Coconut Fibres - Unlike a traditional sprung cot mattress, our baby mattresses are made using a springy core of natural coconut coir (bound with natural latex) that acts as thousands of tiny springs. This helps to better distribute your baby's weight across the entire mattress and creates a more even sleeping surface, helping to reduce the risk of sagging. 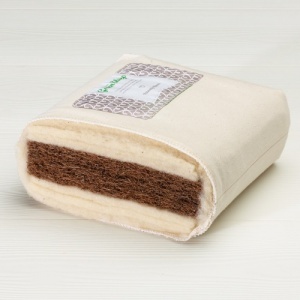 * Organic Welsh Wool - Six luxury layers of organic welsh wool create the perfect support for your baby, naturally dispersing moisture to provide an anti-dust mite environment and help prevent the growth of any harmful bacteria (foam cot mattresses have been proven to encourage the growth of bacteria). The combination of the organic wool and cotton acts as a natural fire retardant , meaning that no fireproofing chemicals are used and each one of our organic baby mattresses passes UK fireproofing regulations (BS 7177) naturally. * Organic Cotton Cover - Each cot mattress is finished with a luxurious, non-removable organic Herringbone cotton cover that is extremely durable yet soft. 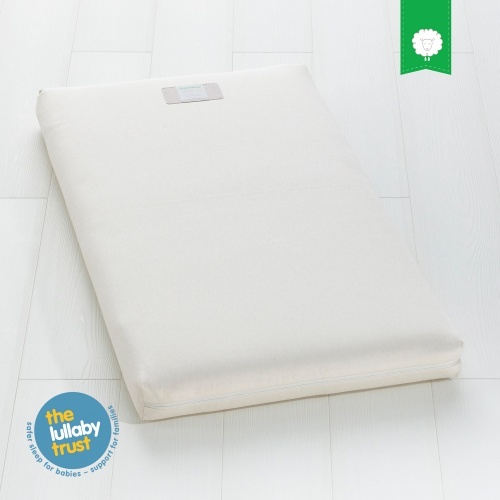 Crucially, this enables every cot mattress to breathe more easily, helping to control your baby's body temperature and avoid the risk of over-heating (as recommended by the NCT to reduce the risk of cot death). - Ensure that your mattress is a good fit and that the gap between the mattress and bed does not exceed 2cm. - Hoovering your mattress can help reduce the risk of dust mites. - A waterproof mattress protector is recommended to create an anti-dust mite layer and protect your baby's mattress from any wetness. Custom sizes also available, just contact us for prices. Arrived in perfect condition and with only a small delay which was instantly communicated directly to me by Earthmother.ie. I was kept in the know at all times during delivery. The product itself is perfect. Dimensions are great, fits the cot snug. Nice and firm when weight put on it but soft on the outer layers. Brilliant design, very happy with purchase. Can sleep soundly now with the little one in the cot. This mattress is really good and I bought this after a friends recommendation. Comparing to other mattresses in the market, I think this is a good investment. It's made from organic matarials and the cover can be washable. Earthmother is a great place to shop because they are so friendly, sincere, fast and I like the little notes on my invoice. It makes me happy everytime. We had a little delay on delivery instead of just informing why, they send me an apology gift which they didn't have to. This is the proof of importance of customer satisfaction to them.